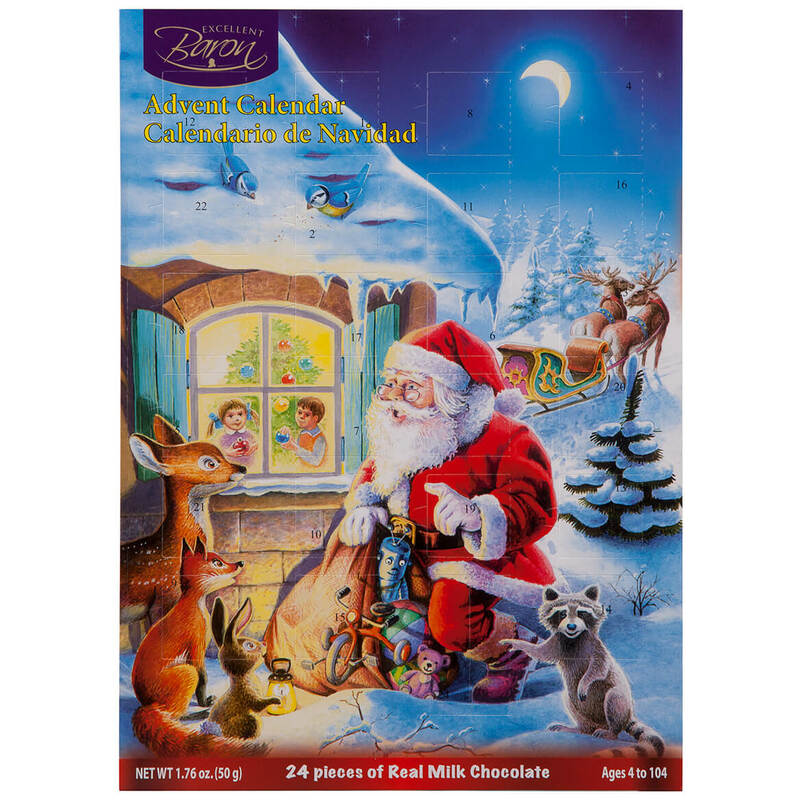 We have always celebrated advent through our church but I decided last year to order this chocolate Advent Calendar for my grandchildren. They range in age from 10 to 22. They all liked it very much so I decided I would do it again this year. When my daughters were young, I did see this kind of Advent Calendar offered in my pharmacy but have not seen again until I saw them in the Miles Kimball catalogue last year. Thanks for the memories and pleasing gift for my grandchildren. Every Thanksgiving I buy Chocolate advent calendars and give them out to my entire family so they can all start the countdowns on Dec. 1st. I would buy them at a local store in Arizona. I moved to California and haven't been able to find a cute selection. These were darling!! I have one family member that already opened it (LOL) and said the chocolate was delicious!!! I have been buying chocolate Advent calendars for over 40 years. It is a tradition I started in Germany with my children at Christmastime. I now give calendars to my teenage grandchildren, neighbor kids and niece and nephew. They would be so disappointed if there wasn't a calendar at Christmastime. They start talking about the calendars before Thanksgiving. They don't care about the chocolates or the calendar per se, but love the anticipation of opening the window every day. There have been some years I have ordered 15 Advent calendars. Thank you so much for the memories. I love to try and eat any kind of chocolate and during the Christmas season certain types of chocolate are only available at that time of year. I bought 4 of these for my youngest grandchildren, because what isn't more fun than the countdown for Christmas?! I'll be shipping 2 to California, and 2 to Nevada, and I KNOW the children will be thrilled with them! I would buy this product every year for my grandchildren. I give these to my grandchildren every year the first of December and they are so excited to count down the days of Christmas with them and it gives them a small special treat each day. I buy from Miles Kimball frequently, however the advent chocolate calendars are a family tradition. There are to many kids in our big family, but something I have been doing for years is giving all the children an advent calendar and giving it out at Thanksgiving. I buy them by the case. The kids expect it and are excited about getting them. Miles Kimball is a fun place to shop. Always great service and great products. Items always perfect in every way. A great countdown to Christmas for kids of all ages. They look forward to having that piece of chocolate everyday until Christmas day comes. I bought these for the grand kids to count down to Christmas. I grandchild asked if they were going to get the advent colander again! So obviously they liked them. They aren't going to share chocolate with me! My Granddaughters loved it. They get a special treat after dinner, and helps counting and finding the numbers. They are 3 and 4. Since my oldest children were young, I have always bought these calanders. It added excitment and anticipation to the month of December and Christmas. Now I can't always find them locally, so it is so easy (and inexpensive) to order them from Miles Kimballs. Also, they ship the calanders directly to my older children and Grandchildren for me. Then I have some shipped home for the little ones still here. They love the suprise and the childhood memory! This is a great value! I buy it every year and the kids love it! Kids love the holiday spirit that the calendar provides. I can't answer any of the above questions because I sent them to three of our younger grandchildren last year. They loved them and commented so favorably about them that I purchased the same thing for them this year and added three more for our great grandchildren. My Teenage Grandkids loved it! It's a great treat counting down the days till Christmas...This is sometimes hard to find in my neighborhood...I wish you had the ones with the countdown to Jesus birth..
ORDER AT LEAST 10 EVERY YEAR FOR GIFTS THEY ARE ALWAYS WELL RECIEVED!!! When Grandma did not see this item in the most recent catalog with other special Xmas things, anxiety set in. Turns out they become available in another week. All the grandkids love these and are delighted to receive them at Thanksgiving. We like that they are tiny treats, fresh and tasty, artfully presented in a way youngsters can relish the Christmas countdown. Grandma loves that they are affordable and reliable quality. This is a great calendar. I purchased two of them and every morning my kids can't wait to open a new chocolate!! Thanks for helping me keep a 30 year plus tradition! I still send these to my 3 grown daughters every year. Best price I've found in quite a while. My kids love this Calendar!!! I'm german, and we grew up with these calendars. I make sure I keep up this tradition with my children. An easy way for young and old to count down to Christmas. My kids are loving it, it is a little twist to have a special treat each day in December. Advent calendar is just what I wanted! Great!! The kids enjoy it! We have fourteen grandchildren and they love counting down the days til Christmas via these delicious advent calendars. My Son is a Happy Camper!! Bought this for my adult son who loves opening Advent Calendars especially with chocolate inside. I have bought these from Miles Kimball for many years and it is one of the only places I can find them. Thank you, Miles Kimball, for keeping them in supply!!!! I ate a chocolate a day to count down christmas! These are the little things children love to do. Counting down the days really builds the excitement. My children look forward to this treat every Christmas. I couldn't find any in stores this year. Next year I will save time and just order from Miles Kimbel! I give these to my children for my 12 grandchildren to enjoy and also to the children in the houses that we rent out. I buy them every year and the kids love them. I buy these Chocolate Advent Calendars for my grandchildren every year. They love to get them. The chocolate inside each dated window is in the figure of something Christmas, like Santa or a Christmas tree. The kids love the chocolate also. I even get it for my 24 year old granddaughter and she looks forward to it each year. I love these advent calendars~~as do the children who receive them. I have bought them every year for YEARS now~~a favorite holiday tradition !! I give these advent calendars to my grandkids every year late November, who look forward to the calendars as their daily "piece of chocolate" as a special treat. They would be very disappointed if they didn't receive these. Great item for the money .. and delicious candy, so I'm told by my grandkids. I send these Advent calendars to the grandkids each year. My 5 grandchildren would be disappointed it I showed up on Thanksgiving with their Advent chocolate calendars. Even the oldest at 18 looks forward to it as well as the youngest at 7. If I forget, the grandchildren call to remind me! Been doing this for many years and the children totally enjoy receiving these Advent calenders. Gets them off and running for the holidays. I gave one to each grandchild, and they love them! They enjoy trying to guess what shape is behind the date almost as much as they enjoy the candy. Since one is still Pre-K, I like that the dates are mixed up, so she has to search for the correct number. We all think the ornament on the back is a nice touch. Grandkids love them and expect them every year. Keep offering them please. These Advent Candy Calendars have become a Tradition for my children; they have shared with me over the years they now really look forward to the silly things every Christmas. The Calendars arriving right before Thanksgiving signals to them, the beginning of Holidays. The children have grown up. Now I send the calendars their children, my grand kids. For many years I had to look, but eventually found these Candy Avent Calendars locally at different merchants etc; in later years the calendars became more difficult to find, to purchase, and then greedy merchants tagged the item with high price, doubling in price llast year, and did so for no for no reason. So, I thought, well I will look on GOOGLE this Christmas Season / POOOF ... BINGO!! GOOGLE lead me right to Miles Kimball whom had exactly what I wanted for all my grand children. No more driiving around in cold searching for Advent Calendars for me, I just get them from Miles Kimball Website now. I have ordered these calendars every year for the last 5 years for my grandchildren. They have become a family tradition. I get reminders starting in September to not forget the calendars. We would likely be facing mutiny otherwise. Advent calendars (with or without chocolate) are a tradition in Germany and I am pleased to continue it in the US with my grandkids. These have gotten hard to find. A family tradition that my daughter passed on to her daughter, so I had to find one for her. Thanks for carrying these. Saved me a lot of time. I give my Grandchildren an advent calender every year this was my first time using Mile Kimball and I will be back for sure, I hope that they get more choices. If your family and/or friends with kids celebrate Christmas, these are a must-have for the kids! It's a very cute Advent Calendar and my grandchildren love to get them every Christmas. For my grandchildren to celebrate Advent. I have passed these out to my son, nieces, nephews, and many other family members and they all ask when they will be getting theirs. Some of my 18 yr old nieces still want them just for the fun of it and the tradition. my granddaughter just loves them. The price was reasonable and it is a fun item for family and friends. My daughter wanted them for my grandchildren in Tennessee and couldn’t find them. As we have always had them for my children growing up. They are very cute and the price is right. The kids love them. Sell out fast in local stores , yearly tradition! Always bought these when we lived in Germany. We need it to help explain Advent and waiting to our special needs daughter. My daughter specifically asked for it. The place I usually get these from did not have them this year and it has become a tradition for Grammie to get these for the grandkids. My grandchildren love these so I get them every year. This is an extra one for the youngest. The family loves this and the candy is good! A friend of our family gave these calendars to our children as thry were growing up and they loved them so we wanted to do the same for some of our friends. Price is excellent. Quality of product is as expected. Kids were thrilled! Have been buying my granddaughter advent calendars since she was a baby and she is now 11. Your site was the most reasonably priced and with good reviews. For my family. They never had them before. I have bought these for our grandkids for many years. They love them! Reminds me of childhood. Besides I love choc! Got last year, and was a big hit with family. It is our tradition for the kids and grandkids. Every year I get one for my daughter and one for me. I have notice that Miles Kimball is the only one that gives a good price on these so I will always choose them for the Chocolate Advent Calendars!!! My grand-children love them. Order them from you every year. Great prices. My Granddaughters love these calendars and the sweet little treat they get each day waiting for Christmas day to get here! BEST ANSWER: there are 24 doors the 24th being Christmas eve when Santa comes-advent calendars are the 24 days before Christmas, so children can start opening them Dec. 1 and that way they know how many days till Santa comes. There are 25 doors on the calendar. One for each day of December leading up to Christmas, plus Christmas day. Yes, it should be 26, since the First Sunday of Advent is November 30, but few would notice. There are 24 doors and 24 chocolates. What does variant mean regarding the advent Christmas calendar? BEST ANSWER: Thank you for your question. It comes in different design covers and is randomly selected. You may not get the picture as shown in our stock photo. We hope this information will be of help to you. It won't let me add to the cart. It may be out of stock. You would have to contact customer service about that. Or if you have a Michael's or Target near you, they usually have advent callendars. Thanks for the replies. I was trying to sent an order out of state for Christmas. BEST ANSWER: Thank you for your question. 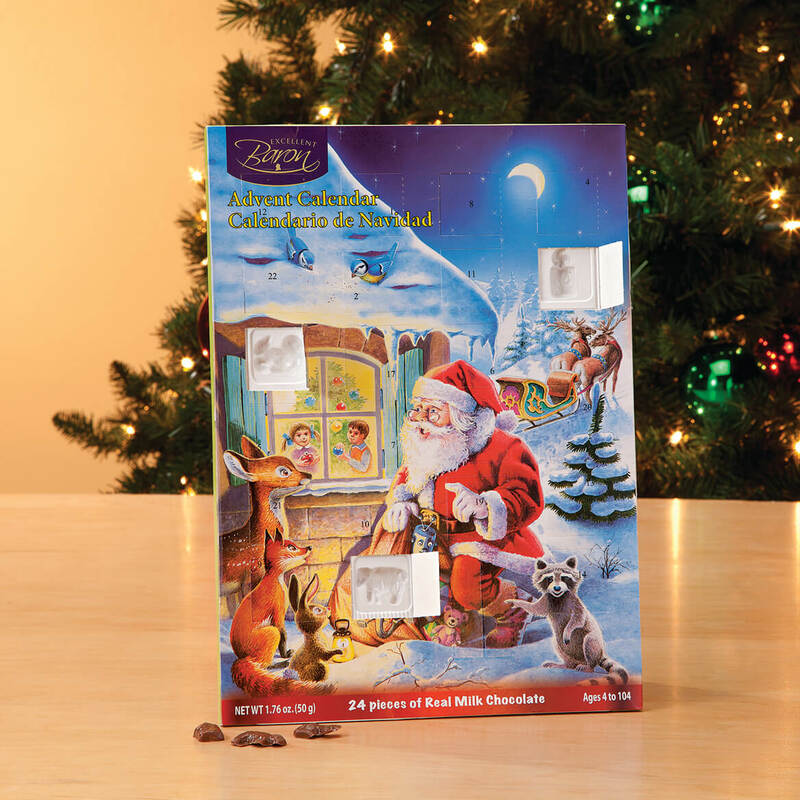 The Chocolate Advent Calendars are made in Poland. We hope this information will be of help to you.